Approximate locations of three robberies reported overnight. • Shortly before midnight, a Domino’s delivery driver was robbed at gunpoint as he returned to his car in the 3700 block of North Marshfield. The robber took the man’s money and then chased the victim with a gun drawn as the deliveryman sped away. • Around the same time, another man was pistol-whipped in the back of the head and robbed of his phone and wallet near the intersection of Marshfield and Waveland, about a block from the first hold-up. The victim was treated by an ambulance crew. The robber in both cases was described as a black man in his mid- to late-20’s who stands about 5’8” tall. He was wearing a red hat and an unbuttoned flannel shirt with gray or khaki pants. Witnesses reported that the robber may have been followed around the area by an accomplice who was driving a black Ford Escape or similar vehicle. Later, a woman successfully fought off a robber in the Boystown area, police said. The woman was walking near Belmont and Halsted when a man pushed her and tried to wrestle away her purse around 2:45 a.m. Police said the would-be robber is a black man in his early 20’s who has beard stubble and dreadlocks. He was wearing a white shirt with gray sweatpants. The man was last seen heading northbound on Halsted Street. Chicago police on Tuesday issued a warning about an increase in robberies across Lakeview and nearby Lincoln Park. 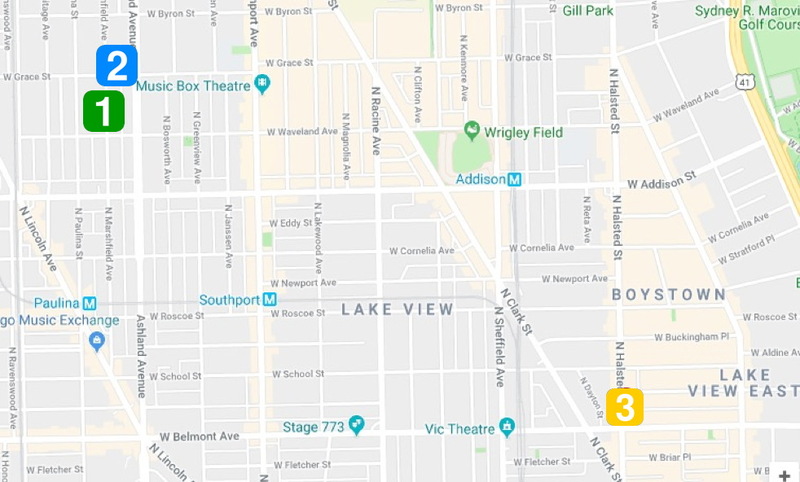 Four hold-ups were listed in the alert, including the armed robbery of Tuco and Blondie, a popular Southport Corridor restaurant that was targeted after closing time on Sunday night. Police say three robbers displayed handguns to “control” the restaurant staff before taking all of the eatery’s cash from the safe around 12:15 a.m. on Monday. Personal property was also taken from the employees, according to previously-released information. A man was robbed at gunpoint by two strangers who approached him from behind and asked him for a cigarette. After asking for a smoke, one of the men put a gun to the victim’s head and robbed him, police said. The two then fled east and disappeared at Paulina. A woman told police that two men attacked her and stole her purse then fled southbound on Hampden. A woman was beaten and robbed by three men who may have exited a black Chevy Impala with dark tinted windows. She was attacked and robbed by the men who fled northbound on Orchard on foot. Anyone with information about the crimes can contact Area North detectives at 312-744-8263.